Can we talk about crispy cookies today? Because it’s not a realm often ventured to here. Chewy? Yes. Yes. Yes. And yes. Plus maybe 6 others. 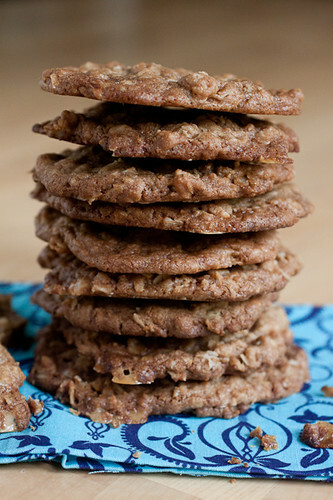 Crispy cookies get a bad rap – and from me included. 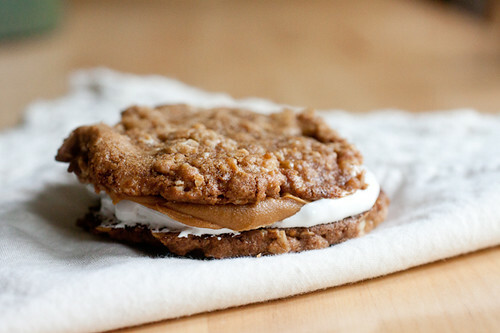 But a couple of years ago when I made those delightful roasted peach ice cream sandwiches, I stuffed that ice cream between two crispy oatmeal toffee cookies and was thrilled with the result. Yes, after the ice cream softens the cookies you basically can’t tell whether they were soft or crispy to start with however, the flavor of crispy cookies changes things. It’s almost like using browned butter in a recipe; there’s an additional layer of flavor that you don’t expect but it nearly blows you away. In a large bowl, whisk the flour, baking soda, and salt together. Stir in the oats. Set the bowl aside. In the bowl of a stand mixer fitted with the paddle attachment or in a large bowl with a hand mixer, beat the butter and both sugars together on medium speed until light and creamy, about 2 minutes. Beat in the egg and vanilla; scrape down the sides and bottom of the bowl. Gradually stir in the flour mixture on low speed, increase the speed to medium, and beat for 5 seconds - the wet and dry ingredients should be well-combined. Stir in the toffee bits just until they are combined into the batter. Using a two tablespoon cookie scoop or a spoon, drop the dough onto the prepared baking sheets, spacing the dough 2 inches apart. Bake for 15-16 minutes, rotating the pans from top to bottom and left to right halfway through the baking time. Allow the pans to cool on wire racks for 5 minutes before transferring the cookies to the racks to cool completely. Repeat with the remaining dough. Store cookies in an airtight container for up to 3 days. In the bowl of a stand mixer fitted with the paddle attachment or in a large bowl with a hand mixer, beat the butter and both sugars together on medium speed until light and creamy, about 2 minutes. Beat in the egg and vanilla; scrape down the sides and bottom of the bowl. Gradually stir in the flour mixture on low speed, increase the speed to medium, and beat for 5 seconds – the wet and dry ingredients should be well-combined. Stir in the toffee bits just until they are combined into the batter. Using a two tablespoon cookie scoop or a spoon, drop the dough onto the prepared baking sheets, spacing the dough 2 inches apart. Bake for 15-16 minutes, rotating the pans from top to bottom and left to right halfway through the baking time. Allow the pans to cool on wire racks for 5 minutes before transferring the cookies to the racks to cool completely. Repeat with the remaining dough. Store cookies in an airtight container for up to 3 days. These sound like such a scrumptious treat! Love this! Oh love the idea of stuffing biscoff and marshmallow fluff between a couple of these! 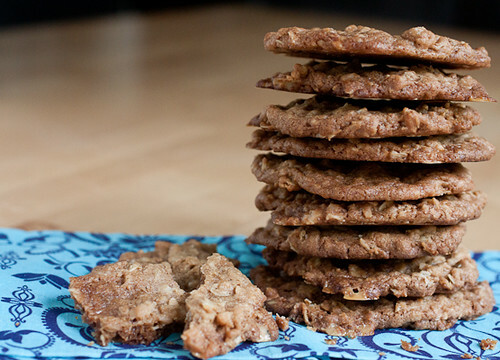 Ahhh, I’ve been waiting for this cookie recipe since the peach ice cream sandwich post!!! Making these tomorrow – they look and sound faaaabulous! I hope they live up to what you’ve been hoping for since I posted the ice cream sandwiches! We loved them a ton – come back and let me know how they turn out, Pamela!